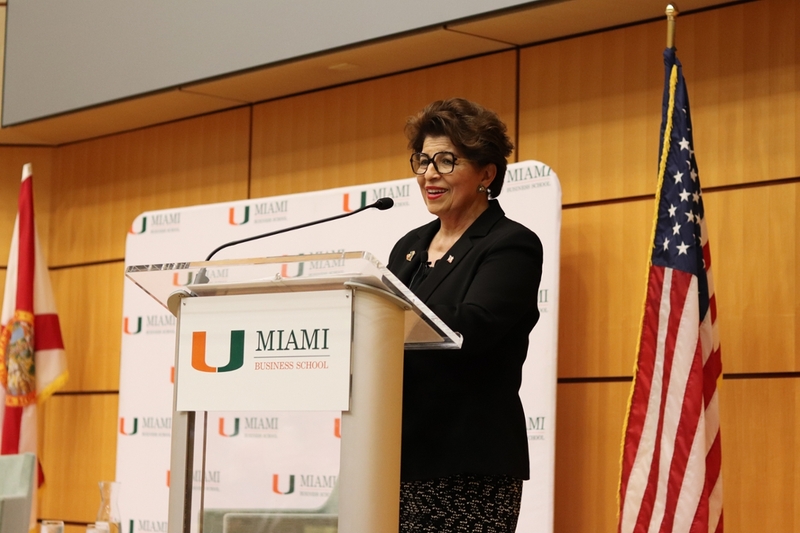 Madam Treasurer Jovita Carranza (MBA '02), the 44th Treasurer of the United States, returned to her alma mater on Wednesday, April 3 for a special guest lecture presented by The Johnson A. Edosomwan Leadership Institute at Miami Business School in Storer Auditorium. During her lecture, she shared a compelling story of leadership and business success through her experience as a Latina and single mother. Hours after her lecture, President Donald Trump announced that he would nominate Carranza to lead the Small Business Administration, replacing the former pro wrestling executive Linda E. McMahon. Carranza is the founder of JCR Group, which provides services to companies and non-governmental organizations. She previously served as deputy administrator of the U.S. Small Business Administration (SBA) under President George W. Bush, after receiving unanimous confirmation. Prior to her service in SBA, Carranza had a distinguished career at United Parcel Service (UPS) where she started as a part-time, night-shift box handler and worked her way up to be the highest ranking Latina in company history where she served as president of Latin America and Caribbean operations. In addition to earning her MBA from Miami, she has received executive, management and financial training at the INSEAD Business School in Paris; Michigan State University; and the University of Chicago. To view photos from the lecture, click here.